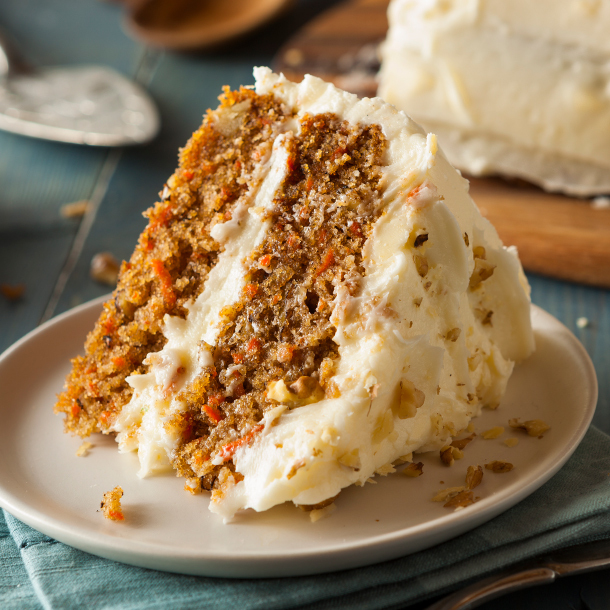 Carrot cake may sound like you’re trying to hide vegetables in a cake; however, it is deliciously moist and sweet (not to mention, topped with the world’s best cream cheese frosting). Make this show-stopper cake for any occasion. Preheat oven to 350 degrees and grease 2 9-inch cake pans. In a large mixing bowl, mix eggs, veggie oil, sugar, and vanilla extract together. Once thoroughly mixed, add flour, baking soda, baking powder, salt, and cinnamon. Fold in grated carrots. Evenly pour the batter into the 2 cake pans and bake for 50 minutes. While the cakes are baking, cream butter and cream cheese together. Add powdered sugar and vanilla extract and mix until fluffy. Once the cakes have cooled, frost the top of one layer, stack the next cake on top, and frost the top of the carrot cake. Enjoy!